Do your clothes from 9th grade still fit? Chances are good that your answer to this is a resounding “NO” (or maybe, “I wish!!) Over the intervening years, our bodies have changed. Whether altered by childbirth, injuries, or simply more calories consumed than expended, most of us are differently proportioned than when we were teens. We accept this (although we may long for that slimmer physique at times), just as we accept that our life experiences have given us greater wisdom, more compassion, and a host of other useful skill sets. So why are we so upset that our riding is now very different than what it was when we were young? I don’t remember it hurting like this! 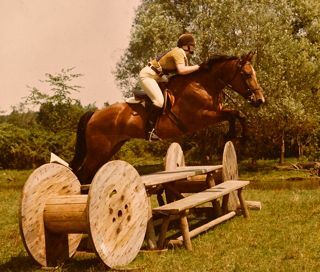 Often we don’t remember things like a sore back, thigh abductors screaming in protest when asked to carry us upstairs a day or two after our most recent ride, or the inability to lift our left foot more than 18” off the ground, necessitating the use of a (large) mounting block. The memory that so many of us feel, but so few vocalize: “I don’t remember being afraid”. And the memory that so many of us feel, but so few of us vocalize: “I don’t remember being afraid”. Don’t make the mistake of viewing all of your changes as negative. Please stop beating yourself up, my friend. Understand that sore muscles are normal. If you had taken up running in 9th grade, you would have experienced sore muscles in the beginning. Coming back to riding, sore muscles are normal. And just as sore muscles are normal – fear is normal. It’s actually our amygdala (the prehistoric, reptilian part of our brain) working overtime to keep us from being prominently featured in the Darwin Awards. Unless your fear is extreme, in which case you might want to consider working with a trainer, a sports psychologist, or a life coach, treat yourself, your sore muscles, and your fear with a gentle sense of acceptance. Understand that the changes we’ve undergone since riding in our teens aren’t “our fault” – they are a part of the process of aging, and better embraced than vilified. Remember that the changes we view as negative are only part of our story. While we may not be as slender, flexible, or brave as we once were, we are now wiser than we were – and that’s a change we should embrace.